The spa waters of Streatham were well known as early as 1670, and indeed sparked the area's initial popularity as a location for wealthy merchants to build their countryside residences. It was not until 1856, however, that a railway station was opened, enabling people to commute comfortably to and from London. 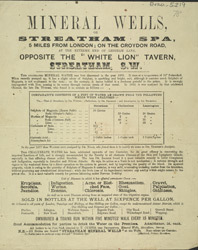 The idea of 'taking the waters' for medicinal purposes regained its popularity in the late 19th century, and the new railway line made Streatham Spa a fashionable resort.